Your heating and cooling, or HVAC, system takes responsibility for a significant amount of your home’s energy use. 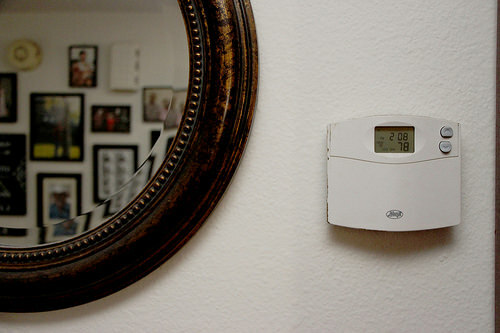 When the temperatures fluctuate outside, you’re likely to experience an upswing in your energy bills as you frantically adjust the thermostat to compensate. Check for air leaks around your home, review your outdoor landscaping, and evaluate your HVAC system’s overall health to maintain consistent temperatures and energy bills all year round. Tiny gaps in your window frames let out lots of treated air throughout the day. Bad window insulation is one of the reasons why your AC or furnace must work harder to keep your interior temperature consistent. If you don’t have the money to replace your windows, attach some weather stripping to fix the problem until you can replace the windows. Blocking those tiny air escape cracks and holes will take some pressure off your HVAC system. If you have gaps around any of your exterior doors or around the door to an unfinished attic or basement, you’re losing significant amounts of energy. Even interior doors with gaps cause problems if you have zoned heating and cooling. You have a few options for fixing the gap. Adding a door sweep will close the gap beneath your door; you can either permanently attach one or slide a temporary one under your door. Adjusting the threshold is another option. When dealing with gaps at the top of your doors, fixing the door frame offers an easier task than rehanging the door. Your AC and furnace lose efficiency every year as parts get dirty and wear out. An HVAC technician performs maintenance on your fans, coils, motors, and other HVAC parts as they start to wear out. HVAC maintenance helps your system run at peak efficiency for years; plus, technicians can catch problems when they’re small, saving you huge repair costs later. The U.S. Department of Energy recommends setting your thermostat to 78 degrees during the summer and 68 degrees during the winter. In the winter at night, you can reduce your thermostat by eight degrees to further save on heating costs while you’re snuggled up under thermal blankets. The same goes for while you’re at work so that you don’t heat an empty house. Set the thermostat to kick back on about half an hour before you get up and before you get home. Plant trees and shrubs around your home to help the temperature inside remain consistent. In the summer, flora blocks some of the sun’s hot rays from getting inside, lessening the amount of work your AC has to do. If you plant evergreen flora, the plants will help keep heat from escaping from your home in the winter. Your energy bills will never be perfectly consistent, especially if you use electricity in the summer and natural gas in the winter. However, reducing energy leakage and giving HVAC system the tools it needs to operate at peak efficiency will even out some of the fluctuations you see.